Memories of another amazing Rollercon! SVRG has been really busy these last few weeks with events and bouts and there's more to come!! Join SVRG for our next home bout on September 26th, our Halloween Blood drive at Silvercreek Sportsplex (check back for details! ), and our junior derby girls' event at the local library! 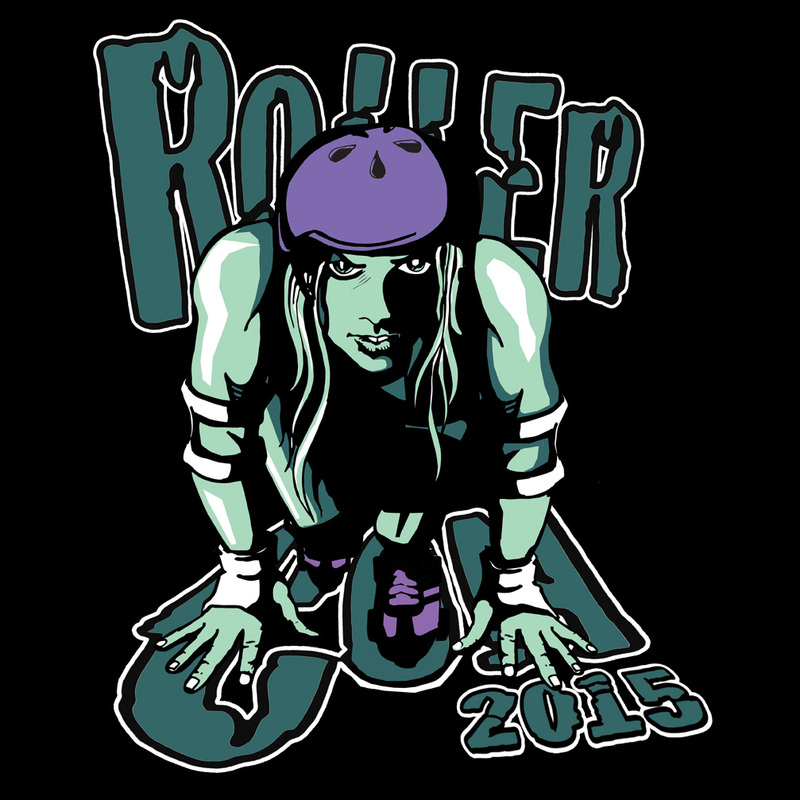 One of the super fun things some SVRGers have been up to this summer is going to Rollercon! Following is an amazing story of some Rollercon experiences from SVRG's own Phyllis Killer!! Enjoy! I'm not an extremely social person but when you are exposed to so many different kinds of people with a similar passion for derby in the hotel, in the elevators, on the walk to the convention center, in the merchandise areas, and at the convention center events, you can't avoid some casual chit-chat with new people. You are forced to interact with wonderful, fun, exciting, interesting kindred spirits! In those moments of talking to other derby people and learning about their experiences on the trip, in derby, and in life, I felt connected to something larger. Something more powerful. I felt connected and enmeshed into the world-wide derby universe. We all had several common goals and mutual interests. 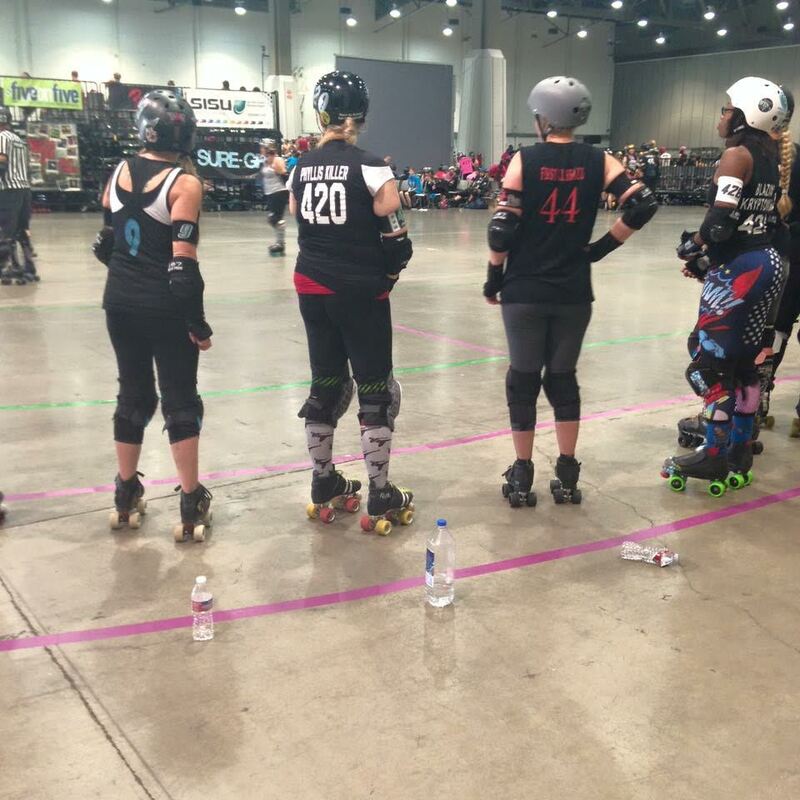 We were there to improve our roller derby skills, play a LOT of roller derby, meet new people, and party big in Vegas. Striking that tender balance between roller derby and Las Vegas partying and exploration was the major problem of the day, and it was a very, VERY nice problem to have! I wanted to get a 5-day or 6-day monorail pass to frequent the hotels on the strip whenever I wanted (they only sold one-time passes, 24 hour passes, and 3-day passes, but I did make good use of the monorail and it took the hassle and discomfort out of walking in the heat). The first time I went to Rollercon (last year), I didn't buy monorail passes. I walked everywhere and even skated. Forget that. You walk enough (far enough and long enough) just getting to and from the monorails and trying to get to the hotels, then exploring the hotels. The Las Vegas strip is much longer and bigger (and hotter) than you can imagine (or remember on subsequent trips apparently). I always misjudged how long everything took to get to! Oh, did I mention that TIME FLIES when you are in Vegas? And there are no clocks to tell you that, so you need to have your phone with you or a watch. Or not. You didn't have to worry about missing a class or scrimmage on any particular day at Rollercon. You more than made up for it walking 8 miles or so per day exploring the hotels and endless stores, restaurants, and bars. You worked out every day, like it or not. On the bright side, this gave you freedom to EAT. A lot! Another one of my goals was to make special "foodie" trips in Vegas. I had so much fun the week before I went to Vegas, just looking up hot places to eat online that had been featured on the Food Network and indulging my palette's every whim! No time for that really. Sad. But the secret you may not have expected about going to Las Vegas during Rollercon time? You lose weight. Countless posts on Facebook affirm that Rollercon trips cause you to lose weight and gain muscle. I am convinced it's from the rigorous advanced-level black and white scrimmages as well as walking up and down that strip. TIP: You NEED to have good walking shoes. Heels? Forget it unless you have a bag or large purse to carry extra shoes in. And if you have thick thighs, you might want to wear either long shorts or very thin pants (it's so hot) because my thighs were rubbing together and I started to get a rash! Ouch! The two foodie-esque places I did make it to were “Secret Pizza” on the third floor of the Cosmopolitan hotel, which is not advertised but designed for discerning foodies in the know, and Carnegie Deli. Well, the pizza at Secret Pizza was sorely overrated (they deem themselves as the best pizza in Vegas and liken themselves to New York style pizza). But lemme tell you, their New York cheesecake was UNDERrated. Oh it melted in my mouth! So amazing! I also ALWAYS go to Carnegie Deli in the Mirage Hotel (which is only in New York aside from there I believe). Yeah it’s expensive, but those potato pancakes, knish, pickles, famous pastrami and corn beef sandwiches, and delectable pies just put me into another world that I don’t have at home. Across the way from that deli is BLT Burger. This is where you go for supremely divine alcoholic milkshakes, delectable juicy burgers, and satiating deep fried pickles. Soaks up the alcohol just like a wonderful sponge! I wanted to eat at some special Italian eateries (at the Venetian and SLS hotels). No time! Those are the carrots on the sticks for me for next year’s Rollercon. Did I mention I exchanged my bra for the right to have an SVRG sticker put up on the wall in the Coyote Ugly bar in the New York, New York hotel? Yes I sure did. Some teammates and I went to that bar to get a little wild and get some dancing and drinking and mingling done. Next thing you know we are up on the bar/dance area shaking what our mama’s gave us to block with! Next thing you know, we are being asked for our bras to hang up on the ceiling to add to their collection! Next thing you know, my teammates all say no and I SAY HELL YES! Next thing I know, I’m braless and free as a bird! Next thing you know, the bartender is holding my head back and has a towel on my chest and she is pouring endless shots straight down my throat as everyone cheers! Well that was an unexpected turn of events that earned us some team promotion in the bar and our sticker on the wall! In summary, here’s what I learned at Rollercon. I learned that you can’t help but overplan because it’s all so exciting. But DO plan to allow yourself time that is unplanned. You need time to just go with the flow. There are so many things that spontaneously come up that you may want to do, that were not planned. Let go of your organized, orderly, logical ways for the time that you are there. Give in to whims. Make time to relax and rest. I heard some people in elevators complaining that they were getting stressed and exhausted from the sheer amount of activities, which are just endless. Don’t get that way! This causes injuries! If you plan one thing, plan relaxation time, food and sleep time, and “go-with-the-flow” time. It might be that your friends planned something even more amazing than you did, and you can jump in on the fun with them. Just be open minded and willing to change course and you won’t feel any sense of loss for what you didn’t have time to do or see (or in my case, eat). The biggest challenge is striking that delicate balance between fun and games, literally. Vegas vs. Derby was the ultimate scrimmage in my mind. I would say I did about 40/60. 40% of the time I played in scrimmages and watched bouts (last year the derby percentage was higher). 60% of the time I had fun exploring Vegas and doing whatever I wanted. I don’t get vacations much and am a single mom. So you know I had to juggle all my needs and have some extracurricular fun! Coming back from a foot injury not too long ago, I had to pace myself a bit more and not risk re-injury. With all the walking I did, though, I was staying in shape every single day so I came home guilt-free. I thought about taking next year off from Rollercon, just to spend the vacation time and dollars in a different way. 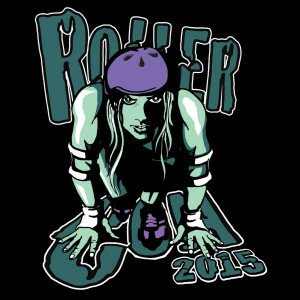 But the more I think about not going, the more I am counting the days til the next Rollercon registration period! See you next year at Rollercon! Stay connected and in the loop by liking us on facebook, checking out our instagram, and following us on twitter.